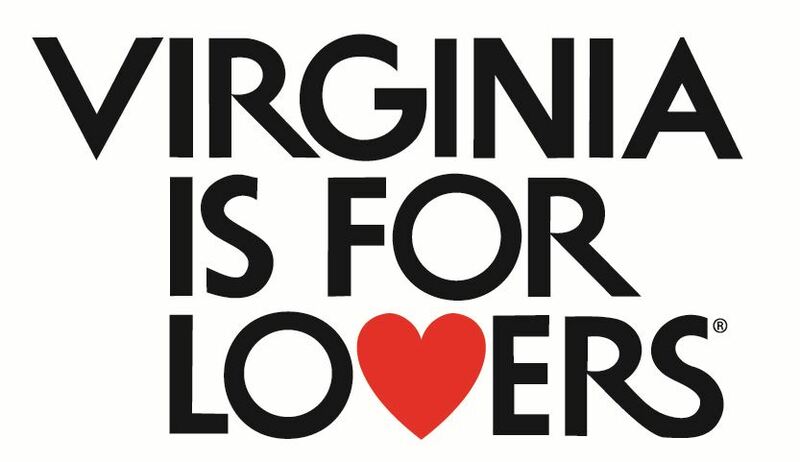 Known as “Vanderbilt’s First Choice,” “God’s Thumbprint,” and the “Garden Spot of the World,” beautiful Burke’s Garden is Virginia’s highest valley and Virginia’s largest rural historic district. This bowl-shaped valley carved out of the top of a mountain offers the most breathtaking scenery this side of New Zealand, with verdant farmland, abundant wildlife, rare bird watching, peaceful biking, and adventurous hiking on the Appalachian Trail. Visit the Mattie’s Place General Store on Gose Mill Road (restrooms available) and enjoy lunch on the porch, 276-472-2222. Pick up a Burke’s Garden Homemakers’ Cookbook while you’re there. Park your car at the mill dam and bike around the “loop,” twelve miles of flat land and rolling hills (you can rent bicycles at Mattie’s if you don’t want to bring your own). Wander through the cemetery with gravestones from the 1700’s at the Central Lutheran Church. 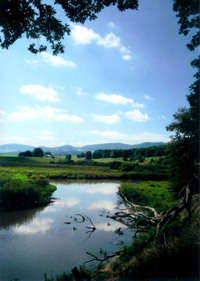 Drive up the forest service road to the Appalachian Trail with several scenic overlooks into the Garden. Hike to the Chestnut Ridge Shelter. Take the time to slow down and really see the mountains. The Burke’s Garden Fall Festival is held on the last Saturday in September, with many farms and the Burke’s Garden Community Center open with fresh-cooked food, handcrafts, and demonstrations of apple butter-making, quilting, cider pressing, sheep shearing, hay rides and more. 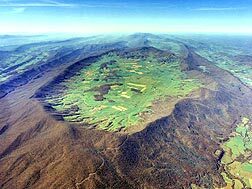 From an aerial view, it appears that this valley could be “God’s Thumb Print.” Enclosed by mountain ranges, the isolated valley is a relatively flat tract high in the Appalachian mountain chain. Created from a collapsed dome, the limestone continues to erode, leaving one of the best farming areas in Virginia. Remains of Indian village locations dot the scenic region, for native Americans used this as a hunting game reserve. Stories of James Burke’s discovery of this valley originated from his experiences when following elk. But when he brought others into the valley, the reported incident about his potato peels growing into potato crop resulted in the spot becoming know as Burke’s Garden. German immigrants followed; descendents still live in this valley. Land was cleared for farming, but several residents continued to make their living harvesting the large game population. By the 1830’s however, a great number of these people moved on into Missouri. An invasion of the valley by northern forces during the Civil War resulted when Union troops traveled from Abb’s Valley to burn Wytheville. General May’s Confederates followed. Disease and looting of horses and food produced lean years in the Garden. The war behind them, a growth in population climaxed around the 1890’s with 1500 people living in the valley. Farming expanded; property became available for homes in which professional people would reside. A change in opportunity unfolded as exporting of cattle and sheep to England became well established. Then came the agricultural revolution with the mechanization of farm equipment. 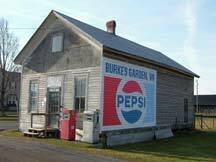 Affected by this course, numerous Burke’s Gardeners left for factories in Indiana. A realization that a cool climate and good grass could produce great-poundage cattle and increase milk production served as encouragement for land owners. Some small-acreage farms were bought by individual land owners. Education and religious institutions were the social outlet for the people of the valley. Private, public, and advanced educational opportunities were available to the local student in addition to those outside the valley. Fund-raising activities plus study clubs presented varied and unique experiences. The valley influence produced many well-known professional people who migrated to other parts of the world as well as those who remain in this section. A religious desire started in 1801 with the arrival of families. The establishment of a community church served residents until after the Civil War. Today, three denominations have houses of worship in the valley. Strong spiritual persuasion in The Garden produced several ministers who have gone out to serve other churches. Old families continue to hold ownership of vast acreage; new faces seize the opportunity to secure a few farms, and the agricultural scene survives. The people of the valley have dedicated their lives to being good stewards of the land. Today, others want to be part of this country atmosphere and come to enjoy the well-kept land, friendly people, and remember life as it used to be. From I-77, take exit 64 (Rocky Gap) to Rte. 61 west toward Tazewell. Go 19 miles to entrance on left at Rte. 623 (Burke’s Garden Rd.). From Rtes. 19-460 take exit 3 in Tazewell. Follow Rte. 61 east six miles to entrance on right at Rte. 623 (Burke’s Garden Rd.). 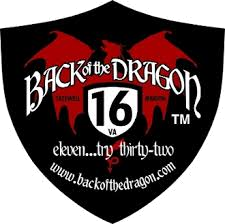 Rural Historic District, Appalachian Trail, Virginia By-Way, The Varmint 10 K Race, Burke’s Garden Fall Festival, Next to Jefferson National Forest, Smallest Telephone Company in Virginia, Scenic Bike Trail, Bear Town-Third highest peak in Virginia wilderness area.